Wanna meet new friends in the blogosphere? 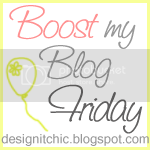 Then link up and be a part of the Boost My Blog Friday. The rules are quite complicated to follow! (Just kidding) Absolutely, there's no rules to follow! The easiest way to build traffic!Just follow the host so that they will be informed that you have joined them and leave a mark on her comment page! hmmwah! Hope you will stop by and follow me back, Thanks. Hello! I'm one of your newest followers from the Friday Blog Hop! I would love if you could return the follow! Thank you so much! Lot of Christmas Giveaways on my blog, you are welcome to check it out!